At the close of Chapter 26, “Knights and Squires,” Ishmael takes an interesting turn in the ever-winding course of his narration. The chapter is dedicated, almost exclusively, to the summation of Starbuck’s character. After describing his background and personal attributes—his “hardy sobriety and fortitude,” his uncommon conscientiousness and superstition, the “telling pantomime of action” which was his life—Ishmael intimates that Starbuck has a flaw in his character that could break him and ruin all his courage. And yet, Ishmael swiftly adds, “were the coming narrative to reveal, in any instance, the complete abasement of poor Starbuck’s fortitude, scarce might I have the heart to write it.” There is a certain democratic principle that requires that we cover of the faults of “the valor-ruined man.” Ishmael extols the rightness of championing the ideal man in every man: that “immaculate manliness,” that divine spark which gives rise to democratic dignity. “[M]an, in the ideal, is so noble and so sparkling, such a grand and glowing creature, that over any ignominious blemish in him all his fellows should run to throw their costliest robes.” In order to justify this perspective—which applies not only to noble Starbuck, it should be noted, but to men as “detestable as joint stock-companies,” “knaves, fools, and murderers,” and other “mean faces”—Ishmael cites examples of lowly men who were, in time, exalted, raised aloft by the “great and democratic God.” Among the number is referenced the famed author of Don Quixote. Miguel de Cervantes (1547-1616) was a Spanish novelist, poet, and playwright. His magnum opus, Don Quixote, is considered by some to be the first European novel and regarded by many as one of the best works of fiction ever written. Russian author, Fyodor Dostoyevsky, called it, “the ultimate and most sublime work of human thinking.” However glorified Cervantes became later in life and after his death, he was not always so. He was born into an extremely poor household, his mother having been sold into matrimony and his father ultimately embargoed for debt. In 1570, he enlisted in the Spanish Navy Marines and sailed on board the Marquesa, among a fleet that defeated the Ottoman armada in the Battle of Lepanto in the Gulf of Patras. During this battle Cervantes received three gunshot wounds: two to the chest and one that rendered his left arm useless. (He would later say that he “had lost the movement of his left for the glory of the right,” no doubt having in mind the success of Don Quixote.) Some time later, Cervantes’s fleet was attacked by Algerian corsairs, and he was subsequently enslaved for five years until he was ransomed by his family. 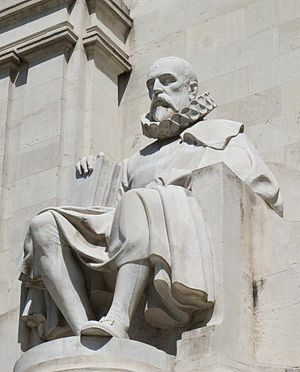 This desperate period in Cervantes’s life, though taking a significant toll on the man’s self-possession and his sense of patriotism and national duty, also supplied him with the raw material for great literary works: most notable among them, Don Quixote, whose publication gained Cervantes international appreciation as a man of letters.